Tushar Joag (born 1966, Bombay,India) Started a project in 2004 called UNICELL Public Works cell. UNICELL is a one person organization that mimics a corporate setup or government bureaucracy. Through UNICELL he suggests absurd solutions to the urban situations around him. Through UNICELL he seeks to make interventions in the urban space, by designing and producing objects that are functional, and aesthetic. The idea is to bring into focus through UNICELL the various concerns of the immediate situation in a satirical way. 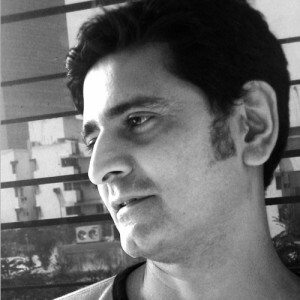 Tushar graduated from Sir J.J School of Art , Bombay in 1988 and completed his post graduation from the M.S University, Baroda. He did a two year residency (1998-200) at the Rijks Akademie, The Netherlands, and co founded the Artist’s initiative Open Circle in 1999. Recent solo exhibitions include ‘Reconciliation and Truth’, Gallery Chemould, Mumbai (2008), ‘Willing Suspension’, Gallery Chemould, Mumbai (2005). Tushar lives and works in Bombay.